Home » How-to, IOS » How to Show hidden files or Hide files in Mac OS? 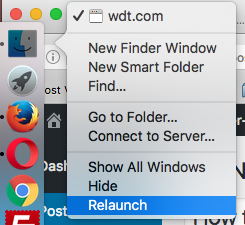 Note: To see the immediate effects of hide and show feature right click on the finder with ‘Option/alt’ key pressed and click Relaunch. Hope it helps. Please do not forget to leave a comment if it helped you. « How to solve PHP Warning: mysqli_connect(): (HY000/2002): Connection refused problem?